Family Laundry: “Half-Naked Woman Found Dead,” by Luanne Castle. Some members of the Herman Noffke family. Luanne does not have a photograph of Louisa, the subject of this piece, who was Herman’s mother. The inspiration and factual foundation for the creatively nonfictional account of Louise’s life and death can be found in detail — with newspaper clippings and photographs — after the piece. This piece can also be found, in slightly different format, on Medium. The “Family Laundry” series traces one writer’s process in transforming the raw material of family history into art. Click here to read Luanne’s introduction to the series. 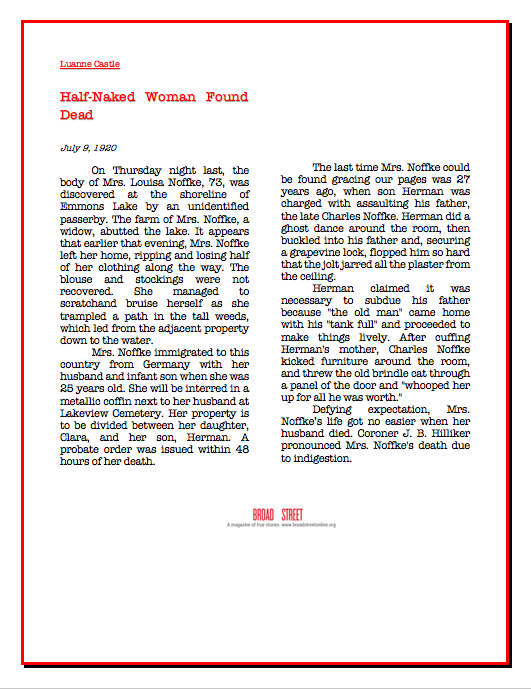 “Half-Naked Woman Found Dead” is presented here as a broadside you can drag to your desktop to print; scroll down to read in plain-text format. Luanne discusses her source material and how she pieced together the story below. To read this piece as a broadside, drag the image to your desktop. On Thursday night last, the body of Mrs. Louisa Noffke, 73, was discovered at the shoreline of Emmons Lake by an unidentified passerby. The farm of Mrs. Noffke, a widow, abutted the lake. It appears that earlier that evening, Mrs. Noffke left her home, ripping and losing half of her clothing along the way. The blouse and stockings were not recovered. She managed to scratch and bruise herself as she trampled a path in the tall weeds, which led from the adjacent property down to the water. Mrs. Noffke immigrated to this country from Germany with her husband and infant son when she was 25 years old. She will be interred in a metallic coffin next to her husband at Lakeview Cemetery. Her property is to be divided between her daughter, Clara, and her son, Herman. A probate order was issued within 48 hours of her death. The last time Mrs. Noffke could be found gracing our pages was 27 years ago, when son Herman was charged with assaulting his father, the late Charles Noffke. Herman did a ghost dance around the room, then buckled into his father and, securing a grapevine lock, flopped him so hard that the jolt jarred all the plaster from the ceiling. Defying expectation, Mrs. Noffke’s life got no easier when her husband died. Coroner J. B. Hilliker pronounced Mrs. Noffke’s death due to indigestion. What led me to the woman at the center of “Half-Naked Woman Found Dead” was a search to fill in the most mysterious branch of my family tree: my grandmother’s mother’s relations the Waldecks and Neffkas. The Noffke-Neffka-Waldeck story is full of tragedy and heartache. As I discovered their story, it was impossible for me not to have an emotional response … and then to write about them. 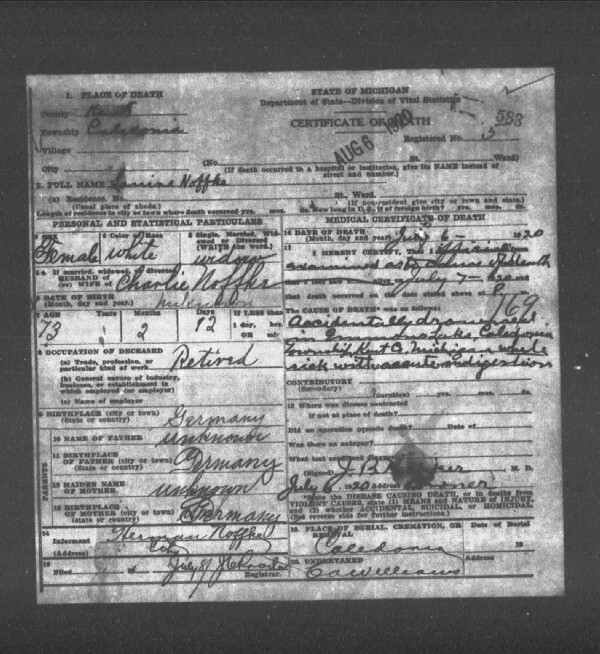 Above: The death certificate of Louisa Rutkofski Noffke.. 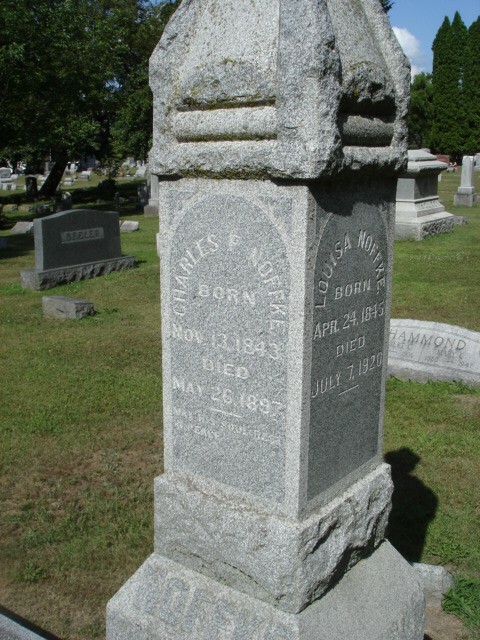 The elder Louisa died on July 7, 1920, in Caledonia, Michigan, at the age of seventy-five, and was buried there. How she died is a matter of mystery — bruised, nearly naked, and suffering from indigestion. So those are some bare facts. But what was Clara/Louise’s life like? That’s where the story lies. The only way we have to peer into her life are newspaper articles. These hint at a dysfunctional home life, to say the least. They tell a sad tale. Unfortunately, I do not have a photograph of Louiza/Louise. Her relationship to me is a bit tenuous; as I’ve noted, her husband, Charles, is the brother of my great-grandmother and Louise is related to me by only by marriage. Nonetheless, she is very much a part of my family and its history. As a writer, I felt a responsibility to tell her story, which is important to the history of women. Below: Louisa and Charles Noffke share a headstone. I grew up hearing about the Waldeck family reunions, and I remember attending one of them, at a small lake house in Kent County, Michigan. When I started trying to fill in that branch of my ancestral tree, my mother told me that Clara’s mother’s family was the Neffkas, and that the reunions were actually of the combined Waldeck-Neffka family. Through an online genealogy search, I met a third cousin from the Waldeck family. She sent me a copy of some of minutes — with family history sketched in— from those Waldeck-Neffka reunions. But I couldn’t connect the historical figures with any documents through the online research site. Eventually, another newfound cousin messaged me through the site, and he gave me the key I was missing: The surname was not Neffka after all, but Noffke, a fairly common Prussian name. This information allowed me to people my tree with generations of Noffkes. Whereas I had sensed a familiarity in the names and places of other family branches I had researched, the Noffkes were unknowns to me — strangers. Who were these people? I expanded my research to newspaper archives in Kent County. That’s when I discovered records of the death of Louisa (Louise) Rutkofski Noffke and of the drunken temper of her husband, Carl (Charles), my three-times-great-uncle. 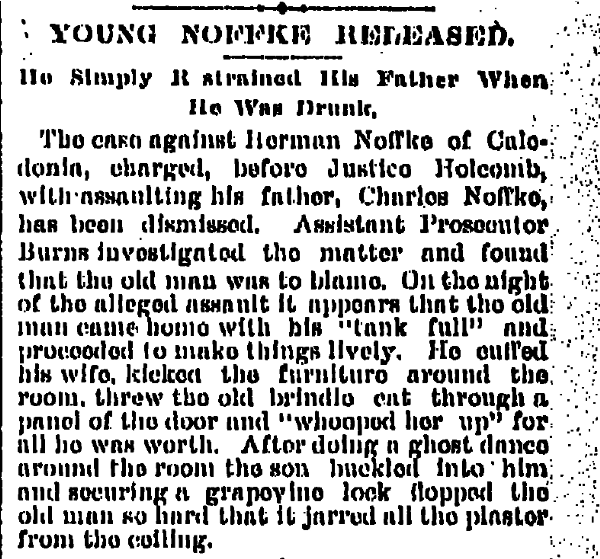 The Grand Rapids newspapers reported on the violence between the Noffke father and son in 1893. Louise and Charles had two children, Herman and Clara, as noted. Charles and Herman were featured in a shocking 1893 newspaper article. Apparently, Charles had a drinking problem and could be abusive; Herman couldn’t take it any more and attacked his father. The story is that Charles came home drunk and acted so violent that Herman assaulted his father in an effort to restrain him. While researching this event, I found a newspaper article that showed me that August, the brother of Charles, had committed suicide by shooting himself in the right temple a year and a half before Herman had to subdue Charles. The newspaper says that the suicide was caused by August’s alcoholism. On 8 July 1920, Grand Rapids was shocked to learn the circumstances of Clara/Louisa’s death. 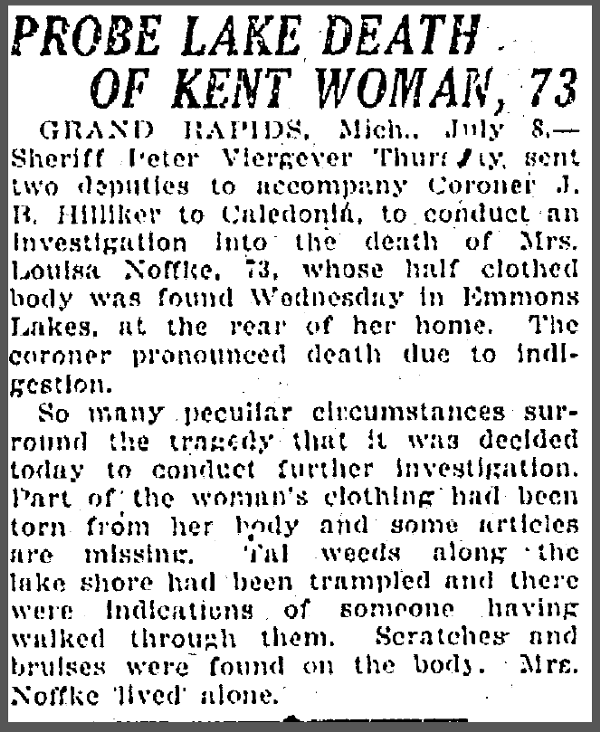 Twenty-seven years later, the events of Louise’s death were also reported in the newspaper. I found them shocking: clothing torn from her body, articles of clothing missing, trampled weeds along the lakeshore, and scratches and bruises on her body. 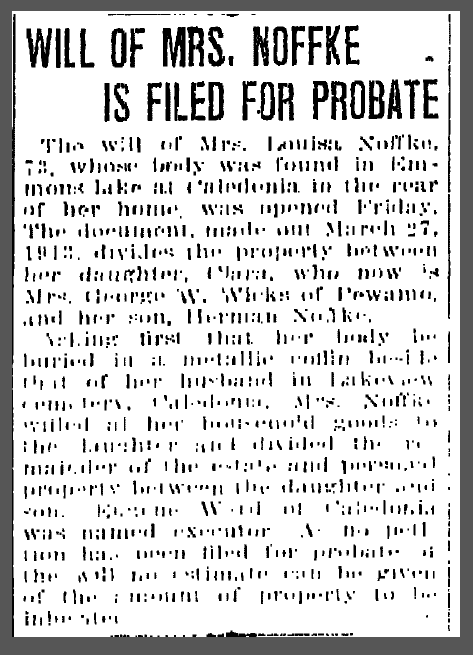 According to the death certificate, Louise died by drowning in the lake while suffering indigestion — which sounds ridiculous, especially in light of these other findings. Although the paper indicated that an investigation had been opened into the strange circumstances of Louise’s death, the resolution of the case was never reported. Just to make sure Charles was not involved, I checked the date of his death. No, he wasn’talive when she passed, because Louise’s estate was divided between Herman and Clara. Louise was listed as a widow on the death record. I later found that Charles had died long before the death of his wife, just four years after the fight with Herman. On 9 July 1920, the Grand Rapids News Leader reported on the will. A sad postscript to the story is that their daughter, Clara, died eight years after her mother, at age fifty-three, in bed — dead from the gas from a coal stove. My research into the Noffkes is far from complete. Genealogists will recognize the difficulty in piecing together a complete story. Until I can flesh out my information, what I know is a few facts about the lives of Louise’s children: that Clara was married to a Mr. Brown (according to the 1900 census report), then was a single woman working as a domestic and living in a boarding house (1910 census report), and then married to a Mr. Wicks (1920 census report). She did not have any children. Herman married a Mary Moraner Finkbeiner and they had (I believe) seven children. 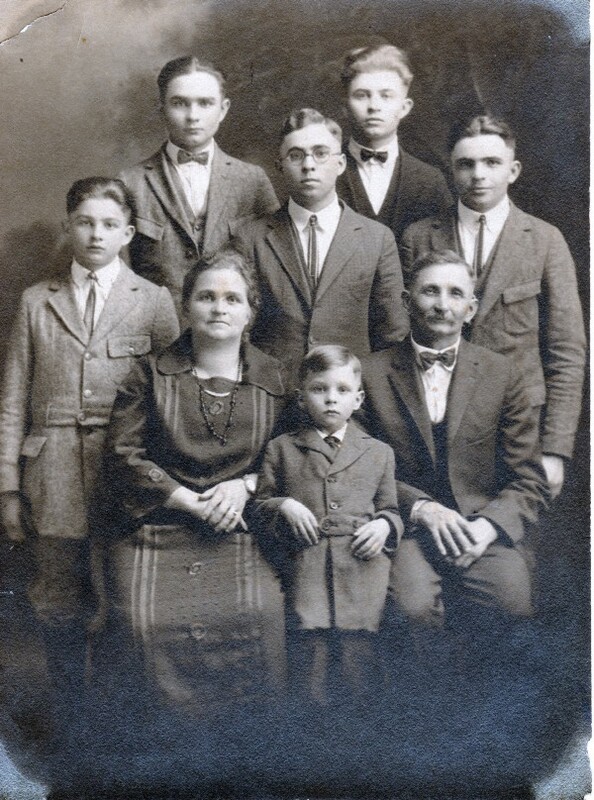 I have located a couple of my Noffke cousins from this branch, and one of them shared the above family portrait of Herman and Mary and their boys. Daughter Mary Louise was not yet born at the time of the photo shoot. I hope someday to come across a photograph of Louise and Charles. Maybe someone reading this now has such a photo — or further information — or another story to help create the full story of these women’s lives. Luanne Castle’s Kin Types, a chapbook of poetry and flash nonfiction, was a finalist for the 2018 Eric Hoffer Award. Luanne’s first collection of poetry, Doll God, won the 2015 New Mexico — Arizona Book Award. Her poetry and prose have appeared in Copper Nickel, Verse Daily, Lunch Ticket, Grist, In Parentheses, River Teeth, The Review Review, Phoebe, and other journals. 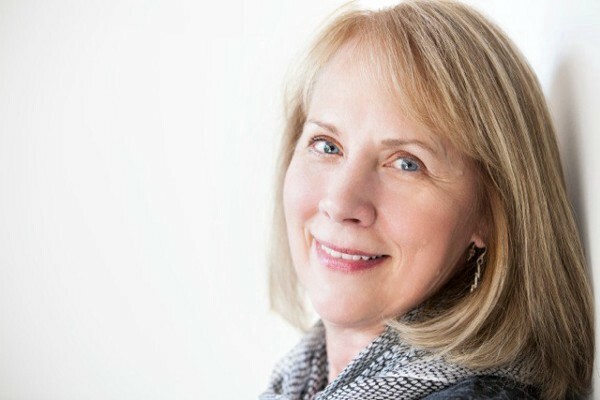 Luanne has reconstructed much of her family history by starting a blog, The Family Kalamazoo, and she continues to add to her knowledge of her ancestors through information from readers. Previous postInterview: The Tiny Paradise of Rebecca M. J. Hymes, Miniaturist. Next postOur Summer 2018 issue, “Small Things, Partial Cures,” has hit the street and the web. Sample some of the contents here now.